I have been creative and doing crafting since I was a little girl. My grandmother taught me embroidery and simple beading. I have been "making things" ever since! I started designing and making jewelry in 2007. A co-worker showed me a catalog for Fire Mountain Gems and I was hooked. 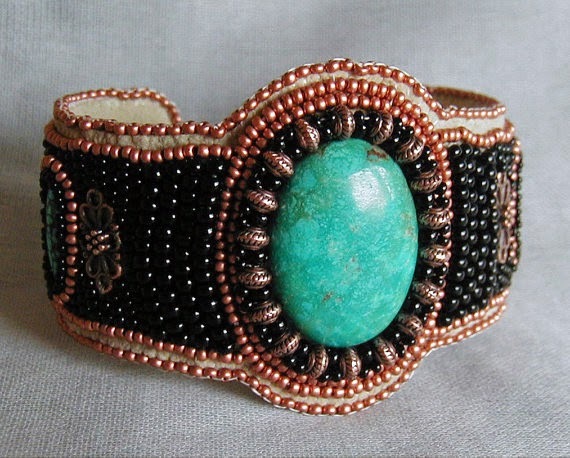 I started learning all I could about beads, beading pattern and jewelry making. I discovered so many wonderful ways to express myself with beads! My favorite type beadwork at this time was bead embroidery. I entered the Fire Mountain Beading contest in 2008 with a piece called "Vintage Sparkle" and I was a Finalist! It was such an honor to be a finalist in the first contest that I had ever entered! I opened my Etsy shop that same year! I love to create beautiful pieces that make people happy! I spend most of my day working on one project or another. I just love the feel of the beads, the colors, textures, the patterns! I would design and make jewelry even if no one ever bought any of it. I just love the process! Check out my blog to see behind the scenes work on my jewelry! I also have a Facebook Fanpage for my shop. I can use all the likes I can get! Thanks!